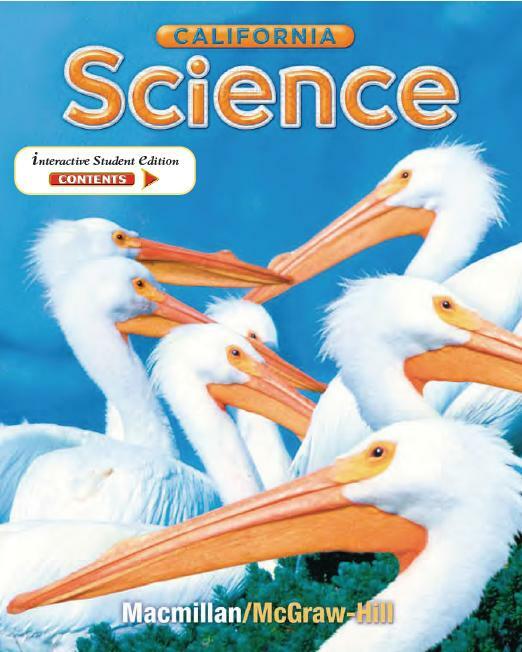 "California Science" develops science concepts through purposeful, hands-on activities, compelling reading content, and dynamic visuals and graphics. It provides pupils with accurate, standards-based content designed to create scientifically-literate citizens. Pupils learn through rich, readable content, strong visual connections, and hands-on activities. LIFE SCIENCE; Living things need Energy, Living things and their Environment. EARTH SCIENCE; Rocks adn Minerals, Slow changes on Earth, Fast changes on Earth. PHYSICAL SCIENCE; Electricity, Magnetism.